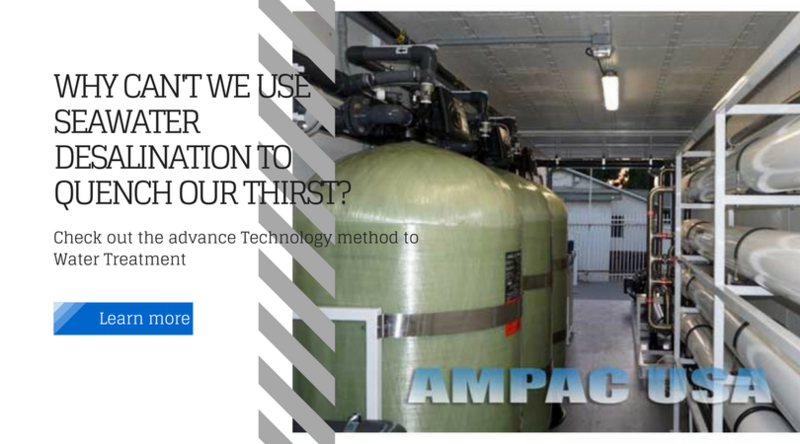 Ampac USA design and manufactures commercial and industrial reverse osmosis water purification systems for brackish water, well water and seawater. Ampac USA: Why Can't We Use Seawater Desalination to Quench Our Thirst? MONTCLAIR, Calif., May 4, 2018	(Newswire.com) - Despite the years that have passed with seawater desalination gaining popularity, it is still not an alternative to traditional freshwater procuring methods. It seems rather unfair that mankind stands in front of a very big payload of water but cannot use it for their benefit. It is like a forbidden treasure to be more valuable than possibly even gold in the future. Millions and millions of gallons of water stand at our feet and even whilst having a perfectly working method to turn it to our advantage, why are we still struggling for water? The answer lies in the answer for why should it not be used. Seawater desalination, although a well-equipped and effective solution for that matter, has several disadvantages owing to the economic and environmental conditions of the world. The only thing stopping us from grabbing our soon to be a dream is the fact that it is not feasible for so many. This is the process of desalting water using thermal distillation or membrane separation. Thermal distillation is a traditional method of boiling the salt water and condensing the vapors this collected into another vessel. The condensed solution is close to the freshwater animals and humans can survive on. A recent and better alternative is membrane separation - the process of which is called reverse osmosis. Salt water is pressurized through a semi-permeable membrane that filters out the salt and other contaminants to give pure, healthy and safe freshwater. By far, this method is proven to be the best method for water purification. This process is implemented at a larger scale in desalination plants that produce water for millions each day. Sounds good! Why don't we use it then? The major disadvantages associated with the procedure include the lack of economic resources. Till now, we haven't been able to point out the figure in dollars for the amount even to the nearest thousands. The money requirement is dependent on several factors. The salt content of the input ocean water. Prices can rise from $1 to $2 in order to eliminate the undesirable salt from the water. The number of people who will need the supply of freshwater structured down to each day. The capacity of the desalination plant which is based on the demand. Also, it decides the number of equipment required to do the job. Usually, the figure ranges between millions of dollars. This is surprising to many as this seems a one-time investment at first glance for a lifetime of profit. But even after investing money in building such a plant, the maintenance cost of the complete plant in itself is higher than many other industries. The huge membranes require utmost care and will need all-around surveillance. Also, the energy required for the operation is very high - reverse osmosis requires a whole lot of it which can be achieved by oil, something the world is currently fighting over. The countries that have the financial backing to do so have already started using this process. Israel, for example, is rich in oil resources and poor in freshwater. They have used their strength to their advantage and hold one of the world's largest desalination plants that not only provides drinking water for people but also for agriculture purposes. A country on the brink of dying out from its worst drought in 100 years today is flourishing like no other. Other countries like Saudi Arabia, Australia, the USA and some countries in Europe have already begun assembling such plants with lesser capacities. It looks like a feasible solution to many but poor countries are the worst affected by depleting resources and no economic platform to rely on. Desalination for them is probably the last resort and water management is their first priority. One major concern associated with this process is its environmental impact. Proper research and impact assessment are yet to be done on how much this process affects the environment - both marine and terrestrial. When a desalination plant takes in water to purify, it does so in millions of gallons. With it accompany several marine species including small fishes, plankton and more. These animals die at the point of entry when the water is pre-treated before reverse osmosis and thereby can potentially disturb the food chain. Not only this but the remnants of reverse osmosis, basically the salt from the saltwater which remains back is highly concentrated. Known as brine in industrial terms, this residue when released back into the oceans can disturb the salt and freshwater balance and when disposed on land, can turn fertile locations into barren lands. Environmental impact of desalination seems to be heavy enough for many countries to not adopt. This process is indeed very useful in providing for millions of people at once. By 2007, there were a total of 13,000 such plants around the globe. By now the number has risen to above 18,000. The impact of the process on the economy and environment are definitely something to deeply think about. However, with increasing water scarcity and deaths, how long can we resist using seawater desalination to quench our thirst? Ampac USA is a leading manufacturer of advanced reverse osmosis water treatment systems. For over 30 years the company has been providing its customers and clients around the world with solutions to their water treatment problems. With years of an impressive track record, Ampac strives to develop solutions to make reverse osmosis systems advanced for improved quality and cost efficiency. Sign up for email updates from AMPAC USA.